Innovation and expansion of product portfolio are two key strategies for the players who are aspiring greater shares in the flourishing market for diagnostic devices and therapies pertaining to dermatology, notifies a fresh business study done at the headquarters of Transparency Market Research (TMR). Increasing prevalence of skin diseases and hair fall cases across the world had led to the mushrooming of specialty clinics that deal with dermatology in particular. Major players of the dermatology diagnostic devices and therapies market are catering to these clinics with their innovative devices and new drug formulations. Another mode of enhancement of product portfolio in this market is acquisition of niche players. For instance, Novartis acquired Ziarco Group Limited late in December 2016 to complement its pipeline for eczema, which is a chronic and inflammatory skin disease that affects several million children and adults across the world. On the other hand, Galderma, which is a skin diagnostic and therapy company based out of the U.S., has been expanding across the Middle East and Africa. The company recently introduced Restylane in Saudi Arabia. The hyaluronic acid fillers are proven to aid to cosmetic surgeries, and Galderma sees the Middle East a fruitful territory. As far as dermatology diagnostic devices market is concerned, advent of portable devices is the latest trend. For example, Dino-Lite has introduced DermaScopes, which are ideal for quick scanning and screening of potential patients as well as offers facility to store and analyze the images later. 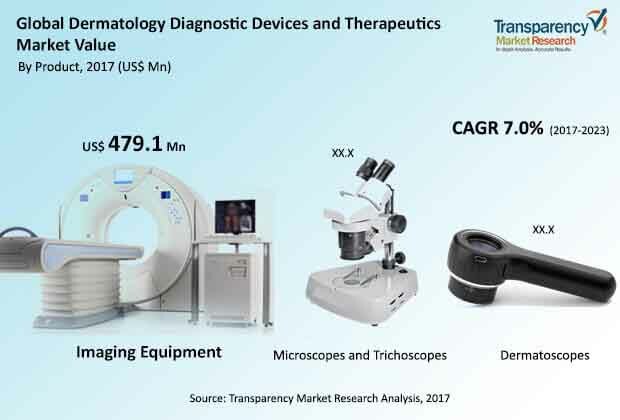 The TMR report identifies Agfa-Gevaert N.V., Astellas Pharma, Inc., Genentech, LEO Pharma A/S, and Michelson Diagnostics Ltd as some of the other prominent players in the global dermatology diagnostic devices and therapeutics market. If the projections of the TMR report are to be believed, the demand in the global dermatology diagnostic devices and therapeutics market will expand at a notable CAGR of 7.0% during the forecast period of 2017 to 2023. In terms of revenue, the dermatology diagnostic devices market is estimated to be worth US$1,015.9 million, whereas dermatology therapeutics market will attain a valuation of US$20,073.0 million. Product-wise, the report segments this market into imaging equipment including MRI, X-ray, ultrasound, OCT, and others, microscopes and trichoscopes including RCM, PAM, and Raman, and dermatoscopes including contact oil, cross-polarized, and hybrid. On the basis of drug class, the market has been bifurcated into antibacterial agents, antiviral agents, antifungal agents, retinoids, corticosteroids, immunosuppressants, and biologics. Geographically, North America has been identified as the region with maximum demand potential, followed by Europe and Asia Pacific. Strong prevalence of skin diseases, growing cases of hair fall, primarily among men, and recent advancements that have led to efficient diagnostic devices and effective therapies are the primary drivers of this market. Specialty beauty clinics are mushrooming across the urban parts of the world and consumers with increased disposable income are opting for the latest therapies to cure this disease that directly affects appearance. Increasing population of middle-aged people and geriatrics is another important factor that is expected to formulate plenty of new demand in the dermatology diagnostic devices and therapeutics market in the near future. On the other hand, high cost of these diagnostic devices and lack of awareness among a huge chunk of population living in the rural parts of emerging economies are some of the challenges that need to be overcome before the market attaining another peak.